We love our beautiful chooks! For those of you outside of Australia, most Aussies lovingly refer to their chickens as “chooks”. It’s kind of a catchy nickname. Anyway, all our chooks are back on the lay after a winter break, and thankfully we are back regularly to eating eggs again. I have missed my omelette once a week for lunch. They are delicious (the eggs not the chooks). When I say all are laying, I naturally omit Bunty. She is the matriarch of flock and top of the pecking order. She was hatched in April 2008 and we bought her in September of the same year. 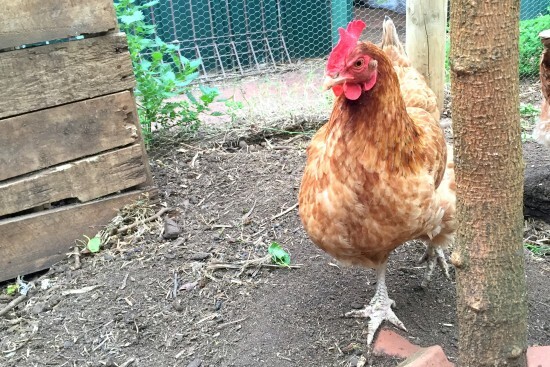 Technically that makes her 7½ years old, which is pretty good for a chook of her breed. I shouldn’t say that she doesn’t lay, because about once a month I find a very small papery shelled egg in the nesting box that only contains the albumen (egg white), which I give to the dogs. Not bad for an old girl! She keeps the other chooks in check, and even makes sure the dogs don’t get too close when they are free ranging. A bit like a pseudo Rooster. Babs is now about 4 years old, and Edwina II is about 3 years old. Both still lay most days of the week, but take a break over winter to allow their feathers to grow back after moulting. Babs is a bit flighty (but has her left wing clipped). She’s not very friendly. Edwina is a timid and tame lass. She likes being hand fed and picked up and stroked and she is my favourite chook. I shouldn’t say that I have favourites because it only leads to heartache when they get sick and eventually fall off their perch. Heaven knows that has happened a few times since we started keeping backyard chooks. It’s just a part of life I suppose. And allow me to introduce Chooky Chicken. For want of a better name, this seems to be the one she comes running to! She is tenacious, bold and likes jumping a lot. Chooky is always the first out the coop door in the morning and first to the food. She even does parkour when waiting for me in the morning. She is an egg laying machine! During winter she laid eggs nearly every day, and hasn’t stopped. I would expect that Chooky will slow down over the coming year as she gets older. Chooky is Edwina’s sister as we got them from the same flock. She also has been getting treatment for scaly leg mites which picked up from some of the local pigeons that try to steal the chook food. Most of the diseases that my flock have caught over the years have been introduced by visiting birds. That is why it is best to keep your girls as healthy as you can. I give them lots of greens as well as most of the kitchen scraps and their daily grain allowance. They also get crushed garlic with their feed once a week which keeps intestinal worms at bay, and I add about ¼ cup of apple cider vinegar to their water once a fortnight as a tonic. It seems to keep them healthy and happy. They also get their little house cleaned out once a fortnight to prevent keep away pests. It’s an easy task and provides brown material for the compost bin which is also a great activator. 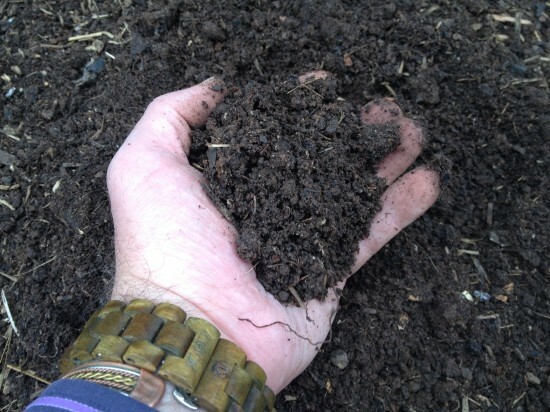 The bedding that is not too soiled is laid on garden beds as mulch. As Bunty is getting on, I checked out my YouTube video collection and found a video that I made the very first day they arrived in our coop with her three sisters (who have since passed on). Seven years is a long time, so see if you can spot her as a youngster! 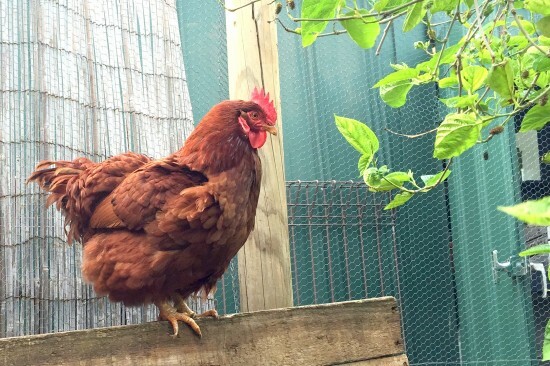 Our suburban food farm wouldn’t be the same without our chooks. They are the best weed and bug controllers around, and turn them into the most amazingly rich eggs. 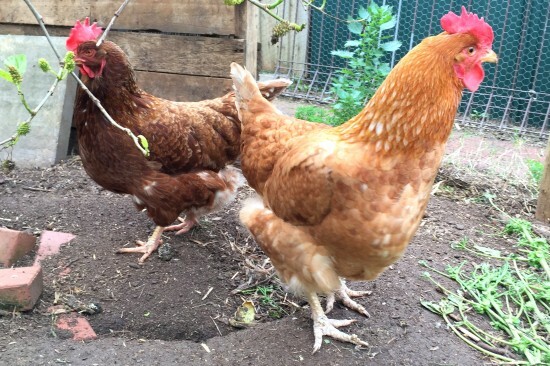 Besides that, I treasure their compost making ability with all that scratching and pooing for creating the most fertile soil to using in my veggie patch. If you haven’t got chooks in your life, I highly recommend you get some if local laws permit. We haven’t looked back since getting our numerous girls over the years. Shout out if you love your chooks too! This show is all about the 22 things you should start adding to your compost bin. If you don’t have a compost bin, I highly recommend you source one, because there are many used household items that you can add to it that gives back nutrients to your garden! From hair to cotton balls, there are so many unusual things that compost bins love to break down for you so that you can share these often wasted nutrients into your garden. Your fruit and veggies will thank you for it! Until next episode, keep it green and divert some of that landfill into compost today!